Sentinel lymph node biopsy (SLNB) alone has been compared with SLNB followed by axillary lymph node dissection (ALND) in sentinel lymph node (SLN)-positive breast cancer patients in randomized phase III trials: the addition of ALND did not further improve the patient’s outcome. However, there is still some controversy, regarding the clinical application of SLNB alone. 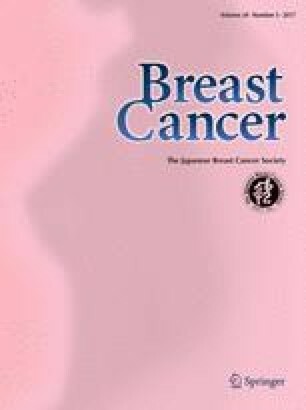 To identify the optimal axillary treatment in the era of SLNB, the Japanese Breast Cancer Society conducted a group study of SLNB in 2014. A questionnaire on axillary surgery and radiation therapy was sent to 432 Japanese institutes in December 2014, and 309 (72 %) completed the questionnaire. SLNB was performed at 98 % of the institutes, and 77 % offered irradiation for cancer treatment. Regarding breast-conserving surgery (BCS), SLNB alone was indicated at 41 % of the institutes in the cases of SLN with micrometastases. However, in the cases of SLN with macrometastases, ALND was performed at 64 %. The proportion of ALND seemed to be higher in total mastectomy than in BCS regardless of the SLN-positive status. In the cases of SLN with micrometastases, the radiation field was localized in the conserved breast at about half of the institutes. On the other hand, in the cases of SLN with macrometastases, it was extended to axillary and/or supraclavicular lesions beyond the conserved breast at about 70 % of the institutes. Japanese breast physicians were conservative with respect to the omission of ALND in SLN-positive breast cancer, especially in the cases of SLN with macrometastases. The work was supported by a Grant from the scientific committee of the JBCS. We appreciate the cooperation of the JBCS and would particularly like to thank Prof. Junichi Kurebayashi at the Department of Breast and Thyroid Surgery, Kawasaki Medical School and Prof. Takashi Ishikawa at the Department of Breast Surgery, Tokyo Medical University.